This is the show of a lifetime…not to be missed!! 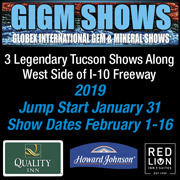 Located in the heart of Tucson; people flock to the show by the thousands. Over 500 exhibitors come from all over the world to showcase their beauties. There are a total of four large, semi-permanent tents. The Gem Mall contains the Cactus & Fiesta tents. You will also be able to ship any and all of your purchases right there from the show. Arthur Gem & Jewellery Co. 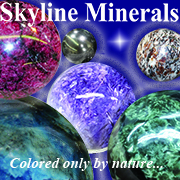 Bright Gems & Beads, Inc.
Fine Stones, Inc / Good Luck Jewelry Int'l. Foshan Nanhai Ande Jewelry Co. Ltd.
GS NM Silver Mfg., Co.
Hoiman Gems & Jewelry Co.
JP Pearl & Jewelry, Inc.
New Prosperity Gem Ent., Co. Ltd. Perfect Pearl HK Co., Ltd.
Siu Cheung Jewellery Fty. Ltd.
Sophie Faith Co. / Evergreen Gemstone, Inc. Victory Gems & Beads, Inc.
Yee On Gems & Jewellery Fty.